The PIC18F8520 is the natural extension of the PIC18F452 device, providing more RAM, more I/Os, a second serial communication port (as well as more timers and CCP modules) on top of the same peripheral set. It is also upward software compatible with PIC16 and PIC17 devices with a pin-out that is functionally compatible with the PIC17C76X family of OTP devices. 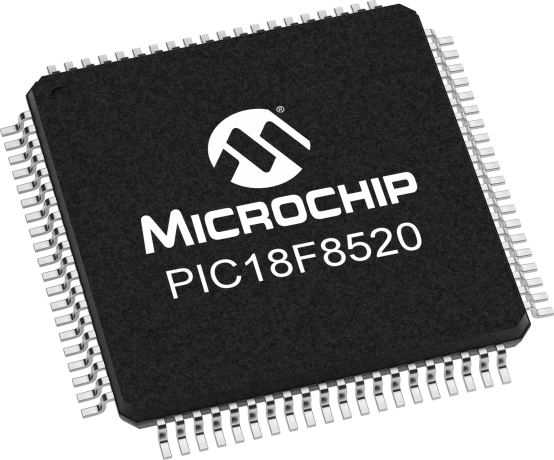 This powerful (10 MIPS) 8-bit microcontroller packs Microchip's PIC18 architecture into a 80-pin package with 32 Kbytes of Enhanced Flash program memory, 2 Kbytes of RAM, 1 Kbyte of data EEPROM, double Addressable USART, and the largest selection of analog and digital peripherals, including External Memory Addressing (up to 2 Mbytes). It is ideal for connectivity applications that benefit from the availability of the double asyncronous serial port, the flexible synchronous serial port (I²C™ or SPI™) as well as large amounts of RAM buffer memory and Flash program memory. These include instrumentation panels, TCP/IP enabled embedded applications as well as metering and industrial control and monitoring applications.